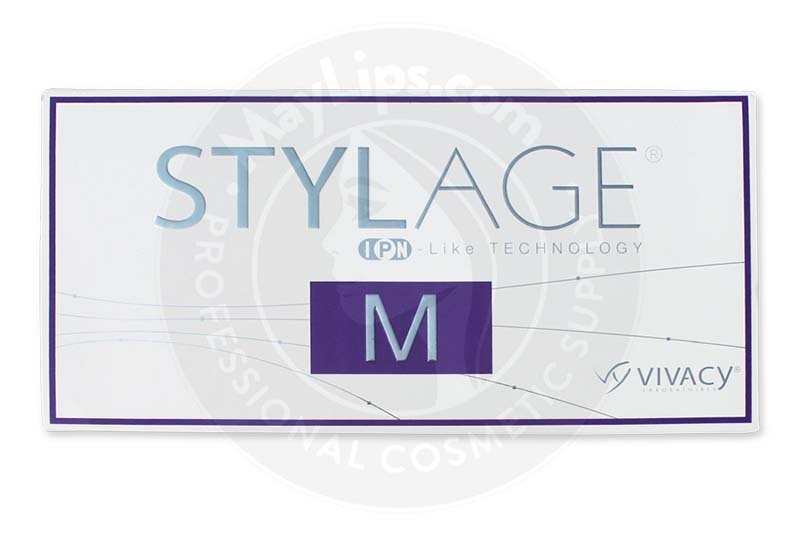 Stylage M is a biocompatible and biodegradable injectable cosmetic filler manufactured by French pharmaceutical company Vivacy Laboratories. Its active ingredients are 20mg/g cross-linked hyaluronic acid gel combined with the antioxidant properties of mannitol. 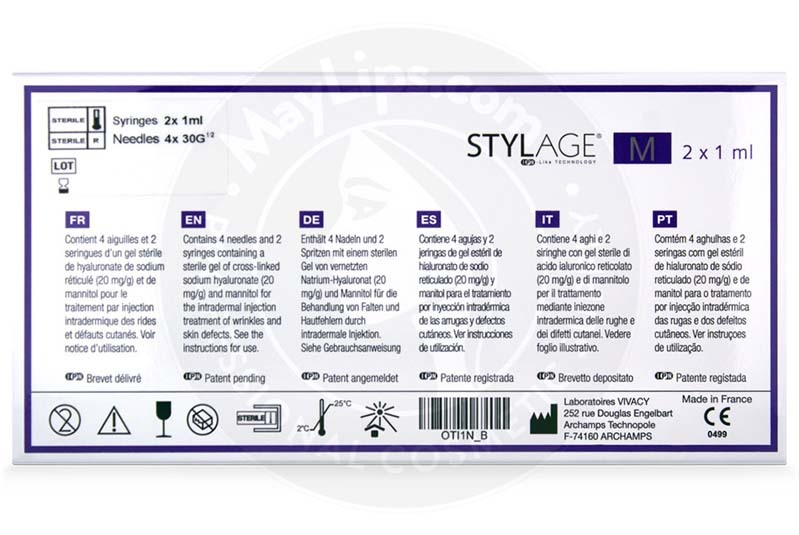 When you buy a box of Stylage M, you will get 2-1mL preloaded syringes, 4 single-use 30G½” disposable needles, a set of labels for traceability, and a product manual. Store this item in a clean room at a controlled temperature between 2℃ and 25℃. Stylage M is an excellent injectable filler for correcting medium to deep wrinkles, including marionette lines and nasolabial folds. In addition, the cosmetic filler can revitalize the appearance of the backs of hands and help contour areas such as the nose. Skin depressions like wrinkles and folds happen when there is damage to the skin’s structure. The production and maintenance of important skin structural cells like collagen, elastin, and hyaluronic acid decelerate as the body grows old. Furthermore, repetitive movements like smiling and squinting can exacerbate these skin issues. So, folds and lines deepen and become more prominent. The hyaluronic acid is obtained biotechnologically and is processed using the patented IPN-Like Technology. This advanced manufacturing process creates a gel that is smoother and more elastic, and helps produce a more natural look and prolonged results. 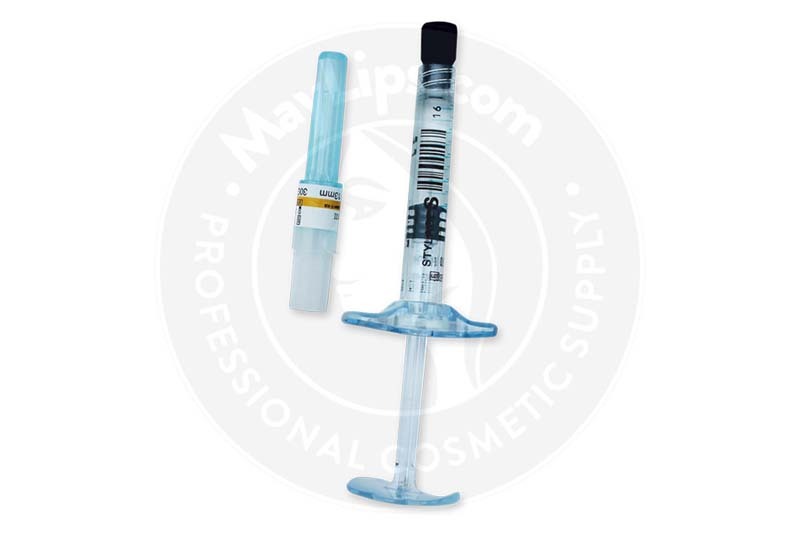 The second distinguishing feature of this medical device is that it contains mannitol. Mannitol acts as an antioxidant, combating harmful reactive oxygen species (toxins). Consequently, the effects of inflammatory reactions are reduced and the filler can last longer in the body before being absorbed. Before a treatment session, prepare the proposed areas with proper cleaning and disinfecting methods. 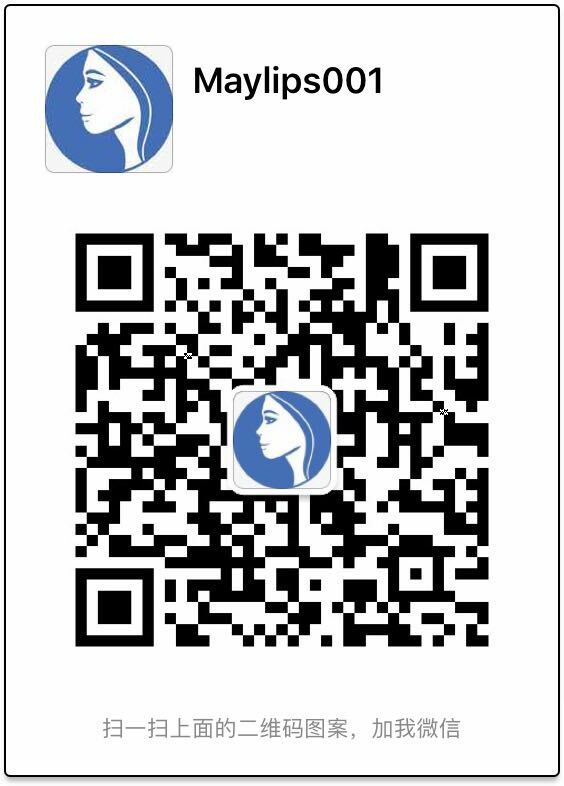 Since this medical device does not contain lidocaine, you can apply an anaesthetic for increased comfort during injections. Alternatively, you can opt to use Stylage M with Lidocaine, which contains the anaesthetic lidocaine for added comfort. Inject Stylage M into the problematic regions via mid to deep dermis injections using the needles provided. Gently massage the area to ensure best product dispersal. Patients should also avoid exposure to extreme temperature (e.g. sauna, hammam, prolonged sun exposure, and cold temperatures) and apply good quality sunscreen to reduce the duration of post-injection inflammatory reactions. Skin that is recovering from other dermal treatments (e.g. dermabrasions or chemical peels). One of this skin filler’s advantages is that it provides a fresh and youthful look almost instantly. 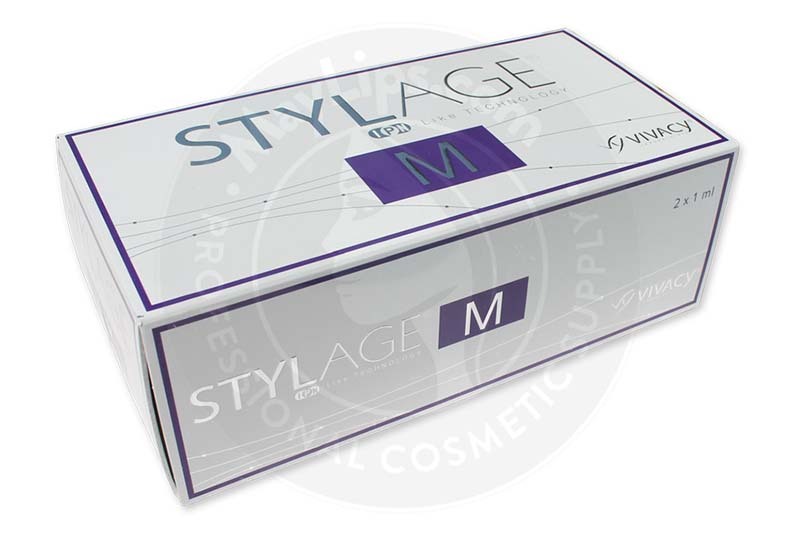 Moreover, Stylage M is a hyaluronic acid-based dermal filler that boasts of long-lasting results. A single treatment session can provide a smoothing and lifting effect for up to 12 months. Individuals with tendency to develop hypertrophic scarring. Educate your patients to get immediate medical attention if the symptoms last more than a few days or if the symptoms worsen. 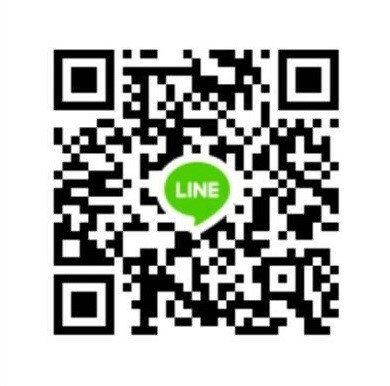 This is a filler gel of non-animal origin. The gel is processed using the patented IPN-Like Technology to produce a monophasic elastic and durable gel. Hence, the filler material can be injected easily into targeted areas while mannitol ensures quick recovery of the skin. Ingredients: Sodium Hyaluronate (20mg/g), Phosphate buffer pH 7.2 and mannitol. Also Included: Contains 4x 30G 1/2 needles and a package insert. A set of labels in order to ensure traceability.